All tourists should know that Aceh Province also has several small islands nearby. 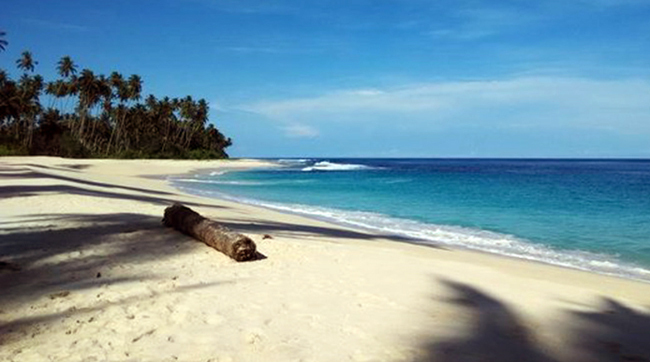 For instance, there is Simeulue Island and it is known for the stunning beach called Pasir Tinggi. The locals named the beach based on the location, which belongs to Pasir Tinggi Village. Still, it is part of South Teupah Sub-District and becomes a signature attraction of Simeulue Regency, Indonesia. So, why do many people love to visit the beach of Indonesia? The most common reason is to enjoy the nuance, which is both calming and astonishing. They visit it for numerous activities like beach walking, relaxation, and photography. The most recognizable characteristic of Pasir Tinggi Beach is the big waves! No wonder, it connects directly to the ocean and no coral reefs prevent huge waves from getting near to the shoreline. Unfortunately, due to the fact, tourists are not allowed to swim in the sea. As an alternative, they can do other activities like beach walking and resting under the coconut trees. The next feature is the white sand, which is both mesmerizing and soft. This explains why most of the visitors would spend much time to walk around on it barefoot. It is true swimming is not recommended in Pasir Tinggi Beach, but that does not mean tourists cannot enjoy playing water. As long as they do not go too far, it is safe to play in the tip of the shoreline. Also, it is better to come to with families or friends so they can watch you while swimming. Have no worries about facilities. The beach provides local guides and some services to hire, including snorkeling gear rent stall. Not to mention the parking area is quite spacious. Apart from playing in the water and relaxation, tourists can enjoy an interesting activity like camping. What? Some spots of the beach are suitable to build tents and spend the night with friends and families! At night, the sound of the waves and the mesmerizing view of the stars in the sky provide you with a serene atmosphere! The thing is that tourists must obtain the permission first before enjoying such activity. Also, it is better to do it in a group instead of alone. What is next? Pasir Tinggi Beach is suitable for photography due to the presence of numerous natural attractions like coconut trees, big waves, white sand, and much more. Though, in order to get the best pictures, it is better to explore the beach thoroughly. This takes some stamina, but it is quite worth it! Moreover, some spots are perfect to be an object for pre-wedding photos. Thus, make sure to explore it well. From Banda Aceh City, travelers need to spend about 40-50 minutes to reach Sinabang City. Next, they need to use either a ferry or speedboat to approach Simeulue Island. Once arriving at the island, it is time to head to the beach, which takes only several minutes by local transportation service.